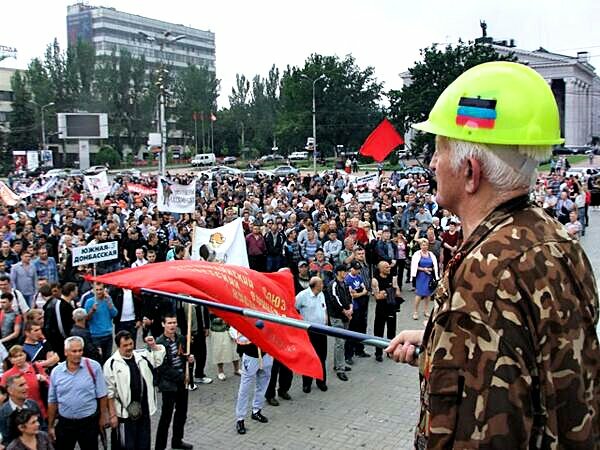 Miners in Donetsk rally against Ukraine military assault on the Donbass region, June 18. A day earlier, hundreds of miles to the east, in the capital of the Donetsk People’s Republic, thousands of mineworkers and their families marched to demand an end to the junta’s “anti-terrorist operation.” Workers from 16 regional mines downed tools to join the protest. The miners issued an ultimatum to Kiev: Withdraw your troops within 48 hours or we will take up arms and join the people’s militias defending Donetsk and Lugansk. By the time their deadline passed on June 20, Donetsk Prime Minister Alexander Borodai had announced: “Formation of a division of miners, who have decided to defend their homes and families, has begun. 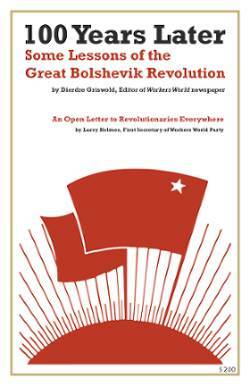 Five hundred people are already enrolled in the ranks,” Borodai told ITAR-TASS news agency. The miners’ determination was given added weight by simultaneous reports that a 4-year-old boy trapped in the besieged city of Slavyansk had just died after being hit by mortar fire. His mother was also killed, RT.com reported. According to a report issued June 18 by the U.N. Commission on Human Rights, at least 356 people have been killed in the latest military operation, 257 of them civilians, including 14 children. Together, the eastern miners and western soldiers’ mothers have given a resounding answer to the fraudulent “ceasefire” plan announced June 18 by Ukrainian President Peter Poroshenko, who represents the U.S.-backed alliance of oligarchs, neoliberal politicians and fascists that illegally seized power in Kiev earlier this year. To great media fanfare, Poroshenko announced that he would declare a unilateral ceasefire “soon” in the war on the southeast. His announcement came after talks with Russian President Vladimir Putin and German Chancellor Angela Merkel. But what was the actual content of Poroshenko’s “offer”? “Poroshenko’s plan would offer insurgents in the eastern provinces that form the nation’s industrial heartland a chance to lay down weapons or leave the country,” the Associated Press reported. If this happens, Poroshenko claims, those who haven’t committed “grave crimes” will be pardoned. By “illegal military formations,” Poroshenko means the popular militias of workers, youths and veterans that have defended the Donbass population from Kiev’s military campaign — but not neo-Nazi gangs like Right Sector, Maidan Self-Defense and the Social Nationalists that have carried out acts of terror against the regime’s opponents, including the massacre of 48 people at the Odessa House of Trade Unions. In fact, Poroshenko’s ceasefire proposal is no different than the threats made by the junta all along. The people’s governments in Donetsk and Lugansk — where the population voted overwhelmingly for independence in a democratic referendum May 11 — made it clear that the only basis for negotiations with Kiev is withdrawal of Ukrainian troops from the region. In fact, the whole population on the Donbass has said “No!” to being ruled by a right-wing regime that seeks to impose austerity, NATO bases and the rule of neo-Nazi gangs on the whole population. Their determination is shared by millions of people in other parts of the southeast, and the unrest is increasingly spreading westward. Even if the population of the southeast wanted to surrender their arms, could Poroshenko’s ceasefire offer be trusted? The real muscles behind his regime are fascist gangs like Svoboda and Right Sector, working in tandem with the oligarchy that has grown wealthy off the stolen, privatized infrastructure built up over decades by the Soviet working class. They in turn are taking cues from the U.S. and NATO as they flex their military and economic prowess against Russia. The massacre of anti-fascists and trade unionists in Odessa; the bombing of downtown Lugansk; the attack on the Russian Embassy in Kiev; and the targeting of hospitals, schools and civilian housing in the Donbass — all demonstrate that no confidence can be put in the Poroshenko regime. To get a sense of what’s really at stake, it is necessary to look past Poroshenko’s declarations, made for the benefit of U.S. and European corporate media, and see what the junta’s supporters are saying among themselves. In a June 13 letter to Poroshenko, oligarch Igor Kolomoysky, appointed governor of the Dnepropetrovsk region by the junta, proposed erecting a 2,000-kilometer-long electrified fence with barbed wire, minefields and ditches along the border with Russia, at a reported cost of $135 million. Kolomoysky’s assistant told Vesti.ua that business owners were already pledging to help fund the project. Coming at a time when tens of thousands of refugees are fleeing Kiev’s military assault by crossing the border into Russia, the proposal has less to do with keeping Russia out than with keeping people opposed to the junta trapped. “Here you have three illustrations of modern Ukrainian life,” said Victor Shapinov of the leftist Union Borotba (Struggle). “The defense minister promising filtration camps and resettlement for the population of the southeast. Prime Minister [Yatsenyuk] calling his fellow citizens ‘subhumans.’ The battalion of the Ukraine Ministry of Internal Affairs fighting under a banner adorned with SS symbols. Now more than ever, it is imperative to build a global movement in solidarity with the People’s Republics and the anti-fascist resistance in Ukraine.